GtkColorSelectionDialog implements AtkImplementorIface and GtkBuildable. The GtkColorSelectionDialog provides a standard dialog which allows the user to select a color much like the GtkFileSelection provides a standard dialog for file selection. The GtkColorSelectionDialog implementation of the GtkBuildable interface exposes the embedded GtkColorSelection as internal child with the name "color_selection". It also exposes the buttons with the names "ok_button", "cancel_button" and "help_button". a string containing the title text for the dialog. Retrieves the GtkColorSelection widget embedded in the dialog. 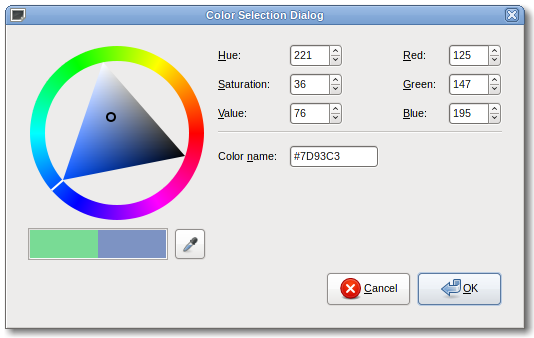 GtkWidget *colorsel; The GtkColorSelection widget contained within the dialog. Use this widget and its gtk_color_selection_get_current_color() function to gain access to the selected color. Connect a handler for this widget's color_changed signal to be notified when the color changes. GtkWidget *ok_button; The OK button widget contained within the dialog. Connect a handler for the clicked event. GtkWidget *cancel_button; The cancel button widget contained within the dialog. Connect a handler for the clicked event. GtkWidget *help_button; The help button widget contained within the dialog. Connect a handler for the clicked event. The cancel button of the dialog. The color selection embedded in the dialog. The help button of the dialog. The OK button of the dialog.